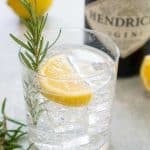 Light and refreshing herbal take on the traditional Gin Fizz, this Rosemary Gin Fizz combines the flavors of rosemary and lemon, is only 5 ingredients and egg-free. Stir while boiling until sugar is completely dissolved. Remove from heat. Add rosemary sprig and allow to steep for one hour while cooling. Remove rosemary before using. In a cocktail shaker filled with ice, add rosemary simple syrup, lemon juice and gin. Shake vigorously and strain into an ice-filled glass. Add soda water and garnish with lemon slice and rosemary sprig. To serve a crowd, prepare simple syrup, lemon, and gin mixture and refrigerate until ready to serve. Divide among glasses and add soda water and garnish when serving. Rosemary Gin Fizz recipe makes one cocktail, rosemary simple syrup makes 1 cup.